The trend is intact and quite positive, despite the one month decline. 2. Involuntary part-time employment is near 25 year low levels. Involuntary part time employment — the primary addition forming the basis of the broad U6 underemployment rate — has dropped to levels only seen for two months in the 2000s expansion, and exceeded for 3 years at the end of the 1990s internet boom. This has never returned to either 1990s or 2000s levels, and has risen in the last 5 months. It might just be noise, or it might not. This is mainly due to two things: (1) the post-2016 recovery in the Oil Patch; and (2) truck and railcar production. The latter is *extremely* pro-cyclical, as a mere slowdown in growth at the final goods levels means a sharp downturn in the orders for new trucks and railcars to support that growth. 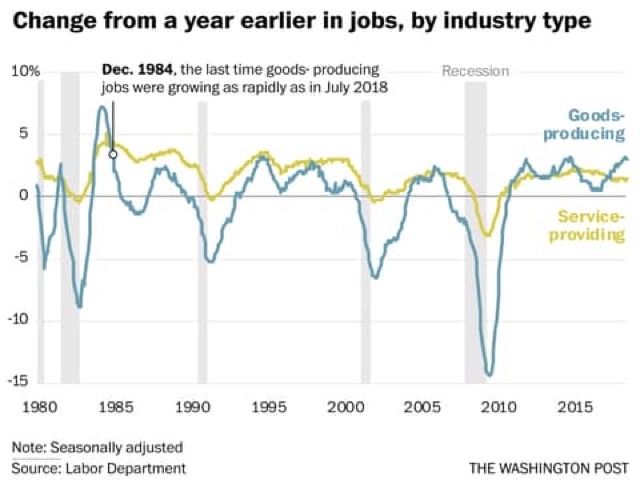 One important note of caution about this trend: in the past, even a two month sequential decline in the rate of growth of goods producing jobs has usually meant a sharp cyclical slowdown at minimum. I counted only 3 occasions in the last 50 years where that was not the case. And on that note, August growth slowed down from 3.75% YoY to 3.5% YoY. Since I am expecting a sharp slowdown in the economy by about midyear next year, if a second straight month of deceleration were to be reported next month, that would be a significant yellow if not red flag.